Since living in Thailand shortly after the death of my father, Father's Day has not meant that much to me. The Thai people celebrate their Father's Day on the occasion of the birthday of the King of Thailand which is on December 5. I wasn't even aware that Father's Day was on June 17, 2012, until I started to see a spike in traffic for the hub I wrote in 2011 in memory of my father's passing away in 2004. On Father's Day 2012 after talking on Yahoo Messenger to my sister in Wisconsin, I started to think a lot more about dad and some of the experiences we had farming the land. 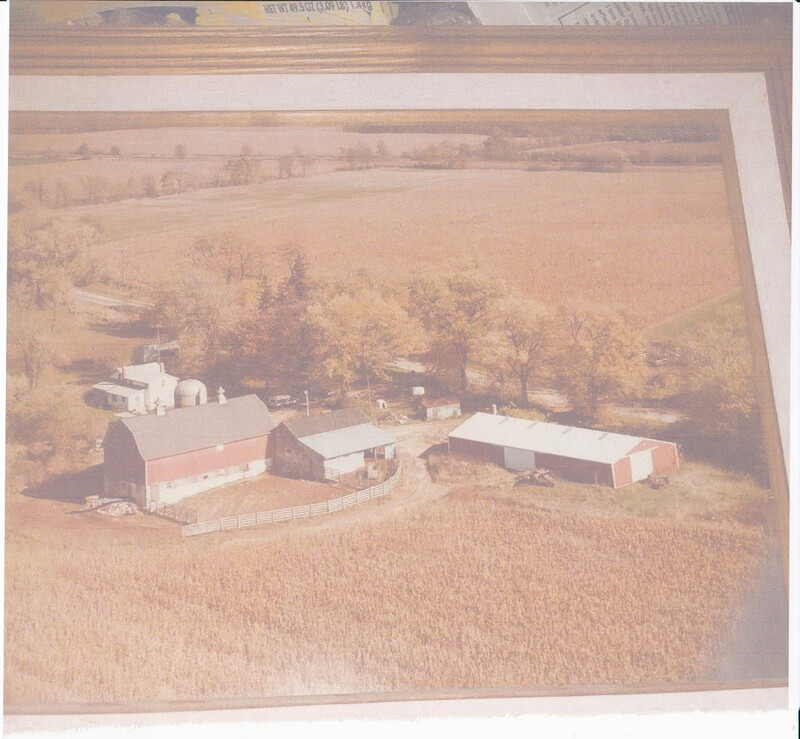 When Pat told me that a neighboring farmer wanted to buy 35 acres of my late parents' estate which was across the road from our old farmhouse and barn, my heart skipped a beat and I felt very sad that ownership was going to be transferred so soon. The memories which I have of farming that land with dad for so many years are priceless. During the first year we worked the land, I remember dad plowing up so many big stones. Some of the rocks were so big that we needed to put a chain around them and with the aid of a tractor pull them out of the ground. Before we could do any planting of crops, we had to take a big flat wooden stone boat and go around the fields picking up the biggest stones. After all of the land was worked up and smooth, dad would first plant oats and seed alfalfa in late April. Then, after the last frost, dad would put in the corn around the end of May. Growing oats was easy; however, cultivation of the young corn plants was necessary because dad didn't spray for weeds at that time. This was a tedious process when the corn was short and young because you didn't want to cover the plants with the ground as you dug up the ground around them with a two-row cultivator mounted on a tractor. After dad showed me how to cultivate, that became one of my primary jobs during the summer. How can I forget the summer of 1957!!! The Milwaukee Braves 30 miles away were in first place and they eventually became World Series champs by beating the New York Yankees. I loved baseball, and that summer the neighboring farm kids, others from the neighboring village of Honey Creek, and I all decided that we would have a team and play games against kids in other farming communities. Since we didn't have a ready-made little league diamond, we made our baseball diamond on a recently harvested oats field. I remember that it was definitely a home run when a hit ball landed in the cornfield beyond right field. The highlight of the game was when we all quenched our thirst by drinking Kool-Aid from an eight-gallon milk can. Dad didn't have any harvesting equipment during our first years on the farm, so we hired a neighboring farmer to bale our hay, harvest the oats, and pick our ripe corn which we didn't chop up and put into the silo. The hardest work was pulling a flat-bed wagon with a tractor and going around the field to pick up 50-60 pound bales of hay and stacking them on a wagon. Many times I did this myself because dad had a full-time job working as a millwright in the city. During the winter after corn picking was finished, I would take the manure spreader every day and spread this organic fertilizer taken from the barn on the cornfields across the road. The ground needed this natural nutrient in addition to the chemical fertilizer we used when planting. While I lived in Maryland, I would drive back to Wisconsin and spend a week with my parents who were a one-half mile north of the village of Honey Creek. During one particular year, dad was in the midst of baling and storing in the hay mow of the barn 500-800 bales of hay which came off the 35 acres across the road. Dad had his own baler then, but it was necessary to hook a wagon behind the baler and collect the bales and stack them on a wagon. Since I was the younger one, it was my job while dad drove the tractor and baled the hay. Stacking the bales of hay on the wagon was only half of the job. The dirtiest and hardest part was unloading the bales from the wagon and stacking them up in the hay mow. I did the stacking while dad put the bales on an elevator which slowly moved the bales on a linked chain into the upper reaches of the hay mow above the lower part of the barn where the cows were kept. We must have spent 2-3 days bailing all of the hay and stacking it in the barn just before a great rainstorm hit. Five years prior to his death, dad was still a very active farmer. Although he had long sold all of his cattle by this time, he still enjoyed growing oats, soybeans, and making hay during the summer. At the end of July in 1999, I returned home again for a visit. It seemed to be the hottest day of the year, and after arriving in Burlington, Wisconsin, after a 14-15 hour drive, I glanced at a thermometer outside of the Bank of Burlington. It registered 104 degrees. The heat was bad enough, but in addition, the humidity seemed to be close to 100 percent. When I stepped out of my air-conditioned car, it was like being in a sauna. Upon getting back home 20 minutes later, dad and mom were complaining about the unusual heat and humidity. Just the same, dad had plans for harvesting his oats the next day. Dad had all the equipment he needed for the harvest since he had recently purchased a used combine and a mobile grain storage box. The only problem was that the combine had some very loose belts operating important parts. These belts seemed to come off of their pulleys and flywheel numerous times while we were combining 15 acres in a field across the road. It was so hot and dusty walking behind that old green combine, but we eventually did get all of the oats harvested and into the grain box. I never saw dad so happy! 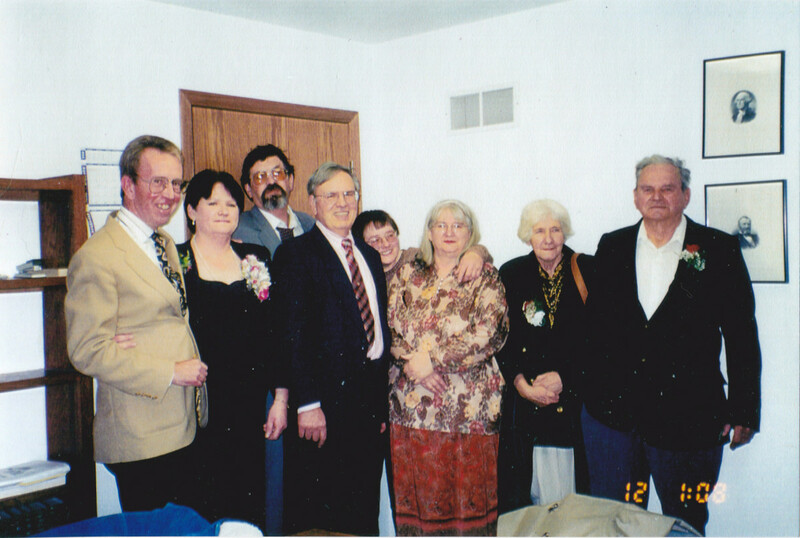 During the times I wasn't at home, mom and dad suffered three mishaps in their later years. Dad cheated death twice while working on these 35 acres. 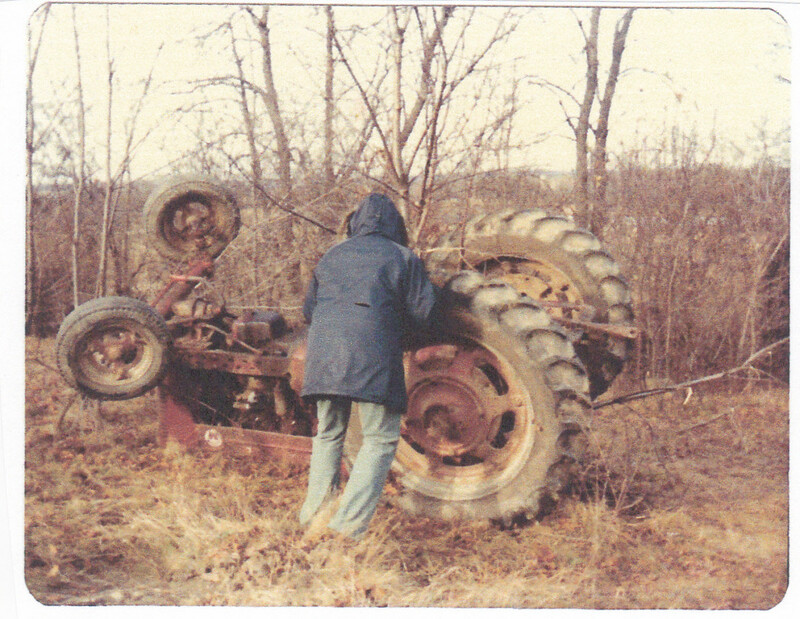 On one occasion in the late 1970s, his tractor tipped over while on a steep embankment in a field. Dad was fortunate in that although he was trapped under the wheel of his tractor, a neighbor soon came to his aid and he escaped unhurt. On another occasion, he was making hay with my younger brother in the early 1980s. My brother, Philip, was driving the tractor while dad was stacking hay on a flat-bed wagon. The wagon evidently shook when it went over a fairly big stone causing dad to fall off. According to my brother, dad looked bug-eyed when coming to his aid, but he escaped with only a couple of broken ribs and no other injuries. During the ten years preceding his death, dad always planted a half-acre garden on part of the 35-acre land site directly across from the farmhouse. He grew very good tomatoes, sweet corn, potatoes, beets, beans and other vegetables. In 2000 when there was a drought, he ran a hose through the garden for watering his plants. Ma tripped over the hose that summer fell, and broke her hip. She also started to develop symptoms of Parkinson's disease in that year. In September of 2013, these 35 acres across the road were sold in settling my parents' estate. It won't be the same now that the land belongs to someone else. There is compensation in the fact that a farmer is buying the land, and he will be planting crops just like dad did. This makes me feel much better than selling the land to a developer who would subdivide the land and then houses would be built. I made a trip to the States at the beginning of October and was able to see those 35 acres again. A buyer has been found and we are now waiting for the lawyers to draw up the necessary deeds and paperwork. I went into the old farmhouse with my sisters and it was strange not seeing mom greet us at the door. As much as we hate to admit it: we can't go home again. The sale of the 35 acres across the road has still not gone through yet. For some reason, our lawyer who is handling the estate sale, and the buyer's lawyer have been dragging their feet in this matter. The farmer who plans on purchasing the land wants to plant his first crop in about 90 days from now. My sisters will not be selling the tracts of land which they inherit, so there will be someone to watch over what is happening to the land. The sale of the 35 acres across the road finally went through in August of 2013. Mr. Schmidt, the buyer, was the same farmer who had waited patiently for over a year. The land has yielded good harvests of corn over all of the years. Thank you very much for reading this hub. I really appreciate your great comments, and I especially thank you for sharing this hub. Thank you once again for reading my hub and leaving such a good comment for this one. As I grow older, memories of dad and I working on those 35 years grow stronger. Rajan, I appreciate you sharing this hub. I also have some warm memories with my father. Loved to read this hub of yours. Thanks for sharing your memories about your father and those 35 acres across the road. Voted up interesting and beautiful. Shared as well. Paul, this such a beautiful documentation of your memories with your dad. I thoroughly enjoyed reading this. Material things remain where they are but with parents gone, they do not hold the same attraction. Voted up, interesting and beautiful and shared and pinned. Thanks for stopping by and I really appreciate your comments. The story about your father is very similar to my father's story. Yes, memories are so important, especially when one grows older. Memories are so important. Your story is very much like my own. 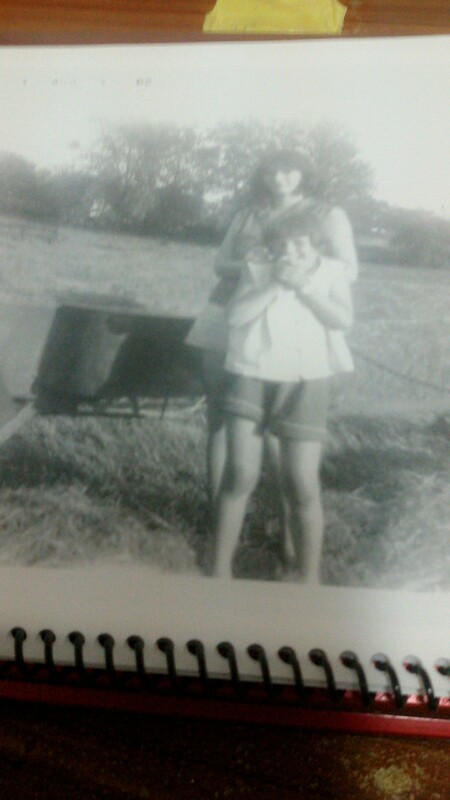 I grew up on a farm my siblings and I inherited. Farm kids learn well what work and values have in common. I lost my dad in 2003. He was a lifelong farmer and tannery worker from Northern Pennsylvania. Funny how these small farms look alike no matter where in the country they are located. I'm happy you enjoyed re-reading 35 acres and I thank you for your great comments. 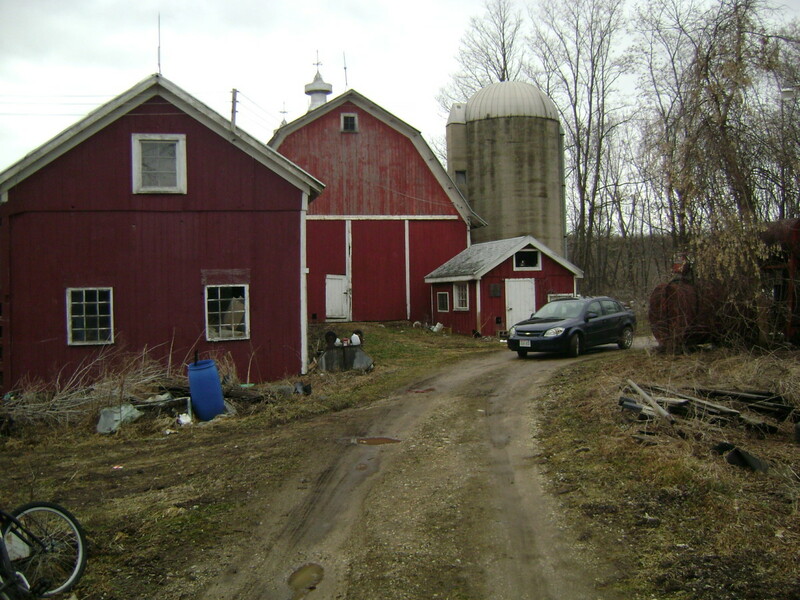 It's really nice that one of my sisters is buying the homestead where the barn and farmhouse are located. Thank you very much for your comments, and I'm very happy you enjoyed "35 acres." If you're interested in dairy farming, you might want to check out the hubs about my sister's farm. Thanks for stopping by again and reading this hub. I'm glad you enjoyed my story, and I'm very grateful for you sharing it. There's no place like the home you remember as a kid growing up. I enjoyed re-reading your memories of youth on 35 acres in Wisconsin just as much tonight as I did the first time I read it five months ago. Even though it didn't seem like going home again when you went there in October, 2012, your memories of those past years will stay with you--even after the sale of that 35 acres goes through. It's good that your sisters will retain their shares of the estate so that there's a link to the land. Thanks for sharing your story. I really enjoyed it. Enjoyed your hub. Our kids still love the old house they grew up in they all said someday they were going to buy it but they never did. They just drive by it every chance they get. Thanks for sharing your story. Voted up and shared. Thanks for the information, Mary. I am going to read your cotton hub right now! Hi Paul. I don't know if they grow cotton where you live, but in the South here when the cotton is in bloom ( and they have a beautiful pink bloom) the fields are pink, then when the cotton is formed, the fields are white as though snow had fallen. Very beautiful. I included photos on my Hub of the way the cotton looks. Thank you so very much for your great interesting comments. I have never been in a cotton field, but I think it would be interesting. How did you pick your cotton? I guess I really should read your hub. I'm glad you liked the hub and thanks for sharing. You sure brought back some wonderful memories for me. I grew up in the country in S. Carolina and we grew mostly cotton. Many days I spent in those cotton fields (I wrote a Hub about that). I'm happy your farm will be purchased by another farmer who will treat the land with love and respect as your Father did. Wonderful Hub. Voted it UP, and will share. Note: yours is the second Hub I have read this morning with no share buttons. I'll go to the feed and try to catch it and share that way. Bill, I am really happy that you enjoyed this hub and I thank you for your praise. By working at it more, I hope to be a much better writer. I'll always remember 1953, the first year the Braves were in Milwaukee. We used to buy Johnson's cookies, a local Milwaukee brand, and in each box there was a Braves picture. I had mom and dad buy so many boxes of cookies so I could collect players like Andy Pafko, Max Surkont, Billy Bruton, and Johnny Logan just to name a few. Yes, I do remember Gene Conley playing for the Celtics. Besides Spahn and Burdette, the Braves also had Bob Buhl, the Dodger killer, as one of their key pitchers. Hey Paul, you hit another home run with this fascinating article. Good job of writing. Losing parents is tough for people on several levels. You dread the loss of course and at the same time you are sad because you know that you're next up. I had another touch of sadness on a totally different level when you talked about the Braves. I was a big Boston Braves fan, but I didn't mind when they moved to Milwaukee, especially since they were so good in Wisconsin. I still followed them. But I hated it when they moved to Atlanta and I have not cared for them since the days of Warren Spahn, Gene Conley (who also played for the Boston Celtics), and Lew Burdette. Even though we've had Roger Clemens, Curt Schilling, and Pedro Martinez in Boston in recent years, I think that Spahn & company are still my all time favorite pitching staff. Keep up the good work. Your farm house and farm really sound interesting. You definitely practiced self-sufficiency farming and seemed to raise and grow everything you needed for life. Thanks for the information. Thanks for reading this article and your great comments. Where was your old farm house located? Thank you very much for reading my hub and for your great comments. I can imagine how your grandad's farm looked in the 50s and 60s. By the way, the 35 acres will be sold in one more month. I enjoyed reading your hub. It reminded me of my grandparents' farm in rural Mississippi in the late '40s and early '50s before my granddad passed away. Some of their acreage was very rich land that was reached by going over a hill and down into the valley that a small river ran through. My granddad, as long as he was able to farm, traversed this distance daily during the planting/harvesting seasons. He single-handedly (in his 50s and early 60s) farmed crops in the area he referred to as "the river bottom" or, sometimes, just "the bottom." Thank you very much for reading and your nice comments. I do miss my father and hope to have memories of him in future hubs. Thanks for sharing these very vivid memories of your father with us I enjoyed reading this hub take care pam. Thank you very much for reading and your comments. I am especially grateful for your sharing. Priceless piece! Memories can't be bought. I never lived in a farm, but was always fascinated by it. Two summers back we rented a farm house with a working farm behind it. What a nice experience that was for all of us. Thank you very much for reading, your comments, and sharing. I greatly appreciate it. A thoughtful and beautiful tribute to your father, to farming, to the old family place. Like you, selling the 35 acres would be hard to do, but since a farmer is buying them, that does ease the sense of loss. Very well done. Sharing. Thanks for reading and your very insightful comments. Dinner at your friend's home is really making me feel nostalgic and hungry, too. I haven't had a meal like that in a long time. I enjoyed reading about your dad and the farm. Being a child on a farm is a wonderful experience. My children thought I was crazy because I love the smell of dirt after a rain. And what I call that "workin' man smell". A little diesel and a little dirt with a respectable amount of perspiration mixed in. You'll miss that 35 acres because your dad is a part of that land. I'm glad there not building strip malls on him. 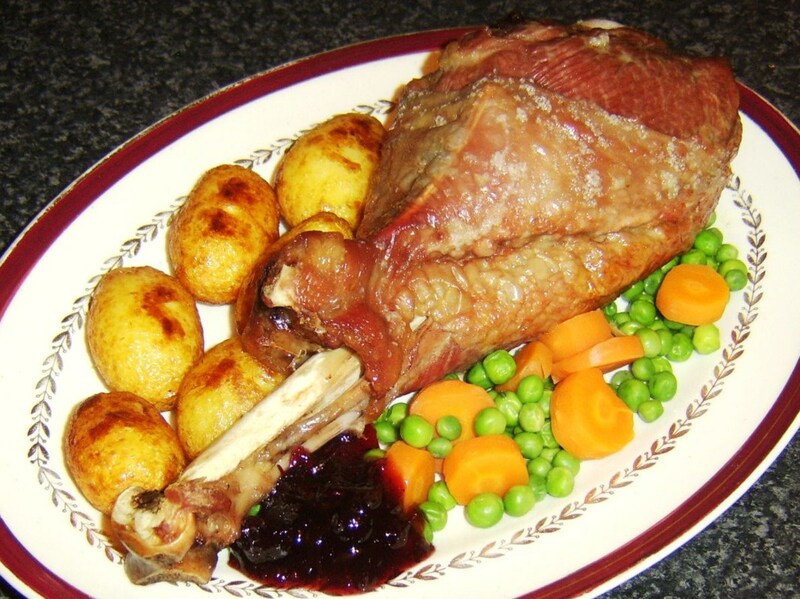 Don't want to rub this in too much but I had dinner at a friends last night. The menu was..... backstrap with gravy, fresh creamed sweet corn, fresh tomatoes, fresh black eyed peas, fresh cucumbers and fresh okra. What a treat! What a friend! Peggy, Thanks for reading and I'm happy this hub gave you happy memories. After the Braves moved out of Milwaukee I stopped following baseball until the Brewers started to get good in 1979 and 1980. Thank you very much for reading and your nice comments. I really appreciate them. These are such precious memories, more precious now that the land is changing hands, but I rejoice with you that it will still be farmland. Who knows? Maybe the new owners will invite you over for baseball after the harvest. Great hub and a wonderful tribute to your dad. Memories are always very special and no one take that away. Sad that you are going to miss your farm land. Hello Paul. Maybe one day you will write a biography of your dad to preserve those memories between hard covers. 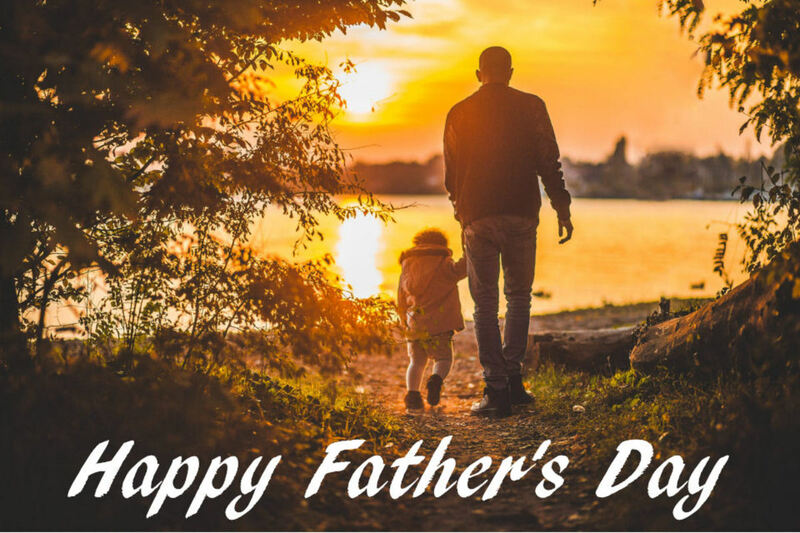 Hope you had a great father's day yourself. 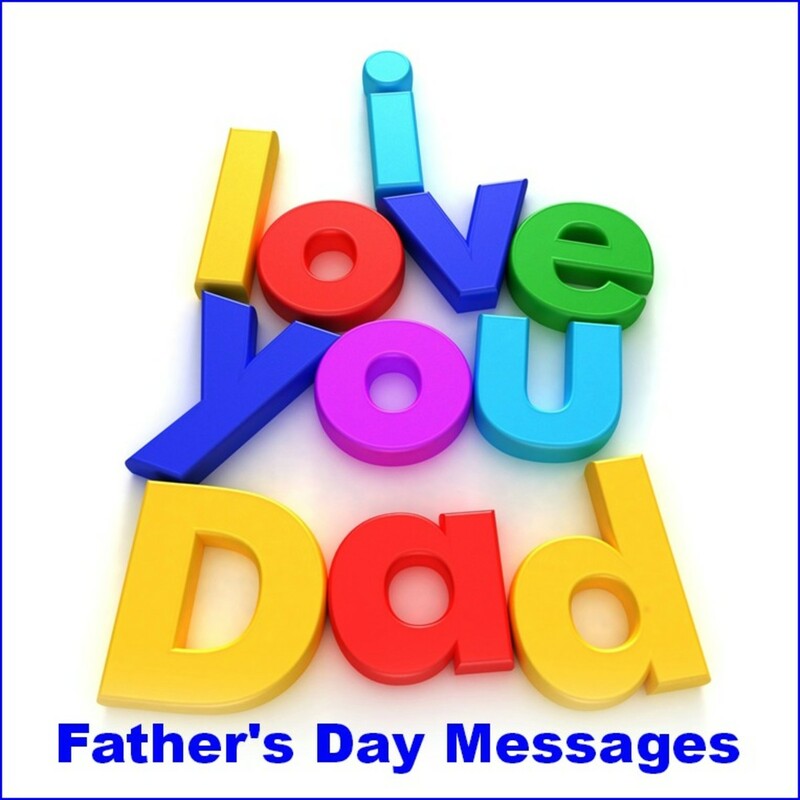 Paul, Sadly, I know exactly what you mean about "Father's Day" since your Dad passed away. However, we all have some special man in our life who we think of and wish a "Happy Father's Day," to. In my case, I have 4 sons who are all Dads to some extremely special "little" people I happen to adore. Memories are wonderful, Paul, and we should all treasure those from our youth and our parents......Those years helped to shape us into who we are!! Looks like you had a happy and healthy upbringing on your farm, country style!! Peace! Isn't it amazing how connected we are to the places we grew up! I was just talking with my dad at dinner last night about our "old house," the one I grew up in. My parent sold it over 5 years ago, and we still talk about it and drive by when we are in the area to check on how it is doing. Thanks for sharing your great memories. Sorry Paul, I meant 'sounds' not 'ounces'. Typing error. Midget, Thanks for reading and the nice comments. Your dad s ounces really homey, Paul! Thanks for the memories!